Use this drawing page as part of a Halloween celebration, or just to give students some practice at learning how to draw non-complex shapes in freehand. 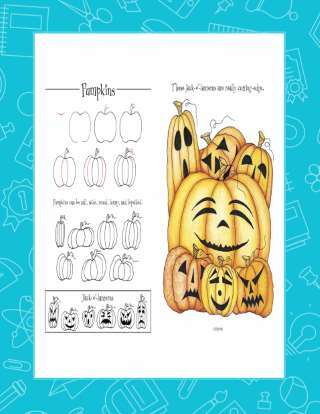 This printable features various jack-o-lantern patterns that students can trace, copy, and modify as necessary. Illustrator Ralph Masiello brings a haunting twist to his popular drawing series. Step-by-step diagrams show young artist how to draw ghosts, witches, jack-o'-lanterns, skeletons, a haunted house, and more. Just follow the simple steps to create creepy critters and eerie objects. Bonus challenge steps show you how to add frightfully fun details to your drawings.